Strikeouts are up across baseball. Well, if you look at strikeouts per nine, that’s not necessarily true. The average K/9 this year is 6.98, last year it was 7.13 and the year before it was 6.99. But all three of those numbers are higher than the previous three years. And if you look at strikeouts as a percentage, as Christina Kahrl did on ESPN Insider today, they are up. Probably because walks are down. This year’s 2.21 K/BB ratio is the highest of the last seven years. Anyway, it looks like pitching has taken a step forward. FIP, or fielding-independent pitching, is down to 3.84 around the league after at least 15 years of being over four. What does this mean for fantasy purposes? Easy: trade pitching for hitting because you can find pitching on the wire. Let’s look at Wandy Rodriguez. He has a 3.88 FIP right now, and is striking out 7.33 batters per nine. He gets 45.6% of his contact on the ground, barely above the 44% average. His 2.6 BB/9 is good, but as the average walk rate has improved to 3.16 this year, it looks less exciting against the backdrop of the league. His 3.25 ERA right now is just about as exciting vis-a-vis the league (13% better than average) as his 3.60 ERA was last year (9% above average). He’s looking like the new average fantasy starter in mixed leagues. 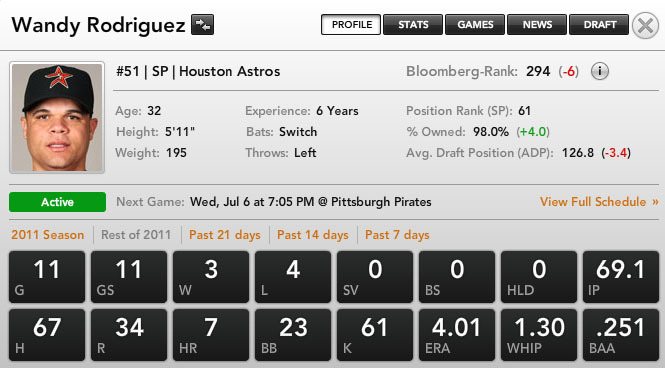 Going into the season, my personal projections had Rodriguez going for a 3.49 ERA, 1.21 WHIP, 12 wins and 189 strikeouts. With his injury, the strikeout total might not come true, but going into the season, the package was worth $11.20 when compared to the replacement-level pitcher, Jorge De La Rosa and his projected 4.13 ERA and 1.33 WHIP with 168 strikeouts in 176 innings. That doesn’t look like the replacement-level pitcher this year. This year’s FIP is 6% better than last year’s. If we move the replacement level about 6% higher, that takes a $1 off of Wandy’s value. All of this is to set up a conversation about the relative value of Wandy Rodriguez in a trade. Say you’re trying to get out in front of a possible trade to the Yankees and you want to capitalize on a player that might not know that pitching is more abundant this year. If you can sell him at $11 and get someone like Jayson Werth or Corey Hart in order to bolster your speed and power, it might make a lot of sense. Even at $10, more Andre Ethier and Nick Markakis territory, you might have to consider it. After all, there’s more pitching on your wire this year, and we’ll be here to help you find it.